Good morning and happy Friday! Today's post is a big one, and it features a few different manicures that I've worn lately that feature the new OPI Skyfall Collection. I probably could have split them up, but I thought it'd be fun to try a spam post like this! Besides, I still have about half the collection left to share, so you'll get another post with those later. This first manicure started with a base of The Spy Who Loved Me. I wore that color for my Halloween costume (I was a shark) and then added the fringe to the tips the next day using Casino Royale. I later realized that this looked a lot like Nailed It's Bleeding Blue gradient. Perhaps I channeled her unintentionally! I was really impressed with The Spy Who Loved Me in particular, and I don't even usually like reds. This one is bright and beautiful, with a great shimmer that was hard to capture accurately. Casino Royale is a nice color too, though I much prefer it in direct sunlight or lamplight. It gets pretty dark when in shade. Next we have a manicure of Die Another Day with an accent of Goldeneye. These two are probably some of my favorite colors from this collection. Die Another Day, a tomato soup orange-tinged red, is particularly stunning in direct light, appearing to glow from within like it would be hot to the touch. Goldeneye is also lovely, with large gold fleck particles that sparkle in the sun. On Her Majesty's Secret Service is a shade unique to my collection. It's a bit greener than my photos were able to capture, and has glints of gold accenting it. 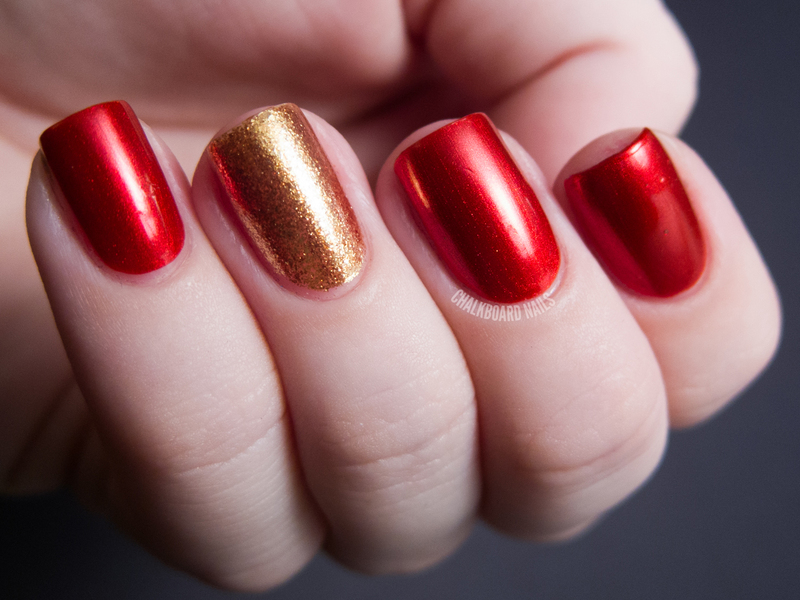 My final manicure in this post is my favorite! I started with a base of two coats of OPI Don't Touch My Tutu, which is not actually from the Skyfall Collection but still a pretty and delicate shade. Then I added one coat of the Skyfall glitter, The Living Daylights. I took a photo at this point so you could see the glitter in its natural state. Then, I made a jelly sandwich by adding one more coat of DTMTT. It completely changed the look of The Living Daylights and I absolutely love the way it came out. The colors of the glitter kind of remind me of a mallard! The OPI Skyfall Collection is available now in professional Salons, including Beauty Brands, Beauty First, Chatters, Dillard’s, JCPenney, Pure Beauty, Regis, Trade Secret, and ULTA, for $8.50 ($9.95 CAN) suggested retail for each Nail Lacquer. Although I don't like OPI, I really liked your manis. The first one looks like a skyline and I really like it's color combo, and the last one... indeed - The best of them all! I love how the glitter turned under the jelly. So pretty! I love the first mani and I was amazed by the different look DTMTT gave to The Living Daylights. the 1st one is the best! OMG- I want Living Daylights so much!!! omg omg omg omg that jelly sandwich....!!!!!!!!!!!!!!!!!!!! I love them all, can't pick my favourite! Wow. Your jelly completely changed the look of The Living Daylights. Love it! I hear what your saying about unintentional channeling. I did the same thing with your diamond design during the 31 Day Challenge. When I saw it posted later by someone else, I 'doh'-ed. I love the jelly sandwich. I was thinking of purchasing TLD for that purpose! That jelly sandwich is TO DIE FOR. like seriously, it's gorgeous! Oh my wow I love the jelly sandwich! I am loving that jelly sandwich! TLD is such a unique, pretty glitter! A M A Z E B A L L S.
Beautiful! The first one is my favourite! So nice and preety! 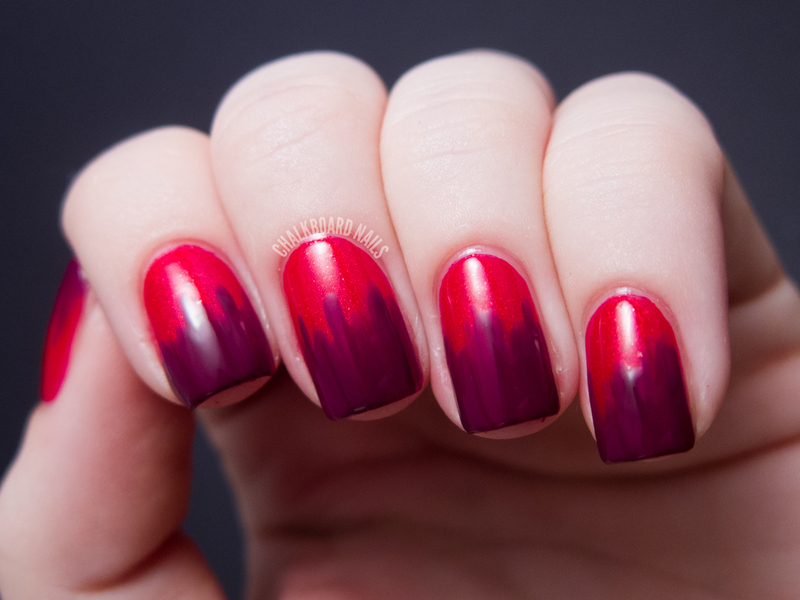 I like the last manicure-jelly sandwich is gorgeous! Loving all of these manis but the jelly sandwich is by far my favorite! I might have to do that this weekend! If I do I will be sure to post it and link back to you. I just can't take how pretty that looks!!! I need to find The Living Daylights, it's sold out everywhere I look! I LOVE the jelly sandwich! My favourites are Die another day and Tomorrow never dies, Me too I like the jelly sandwich! That last one!!!! Wow! I would have never thoufht to do that it looks so cool and reminds me of a clowns getup!! The colors you used for the gradient rock! That came out very nice! 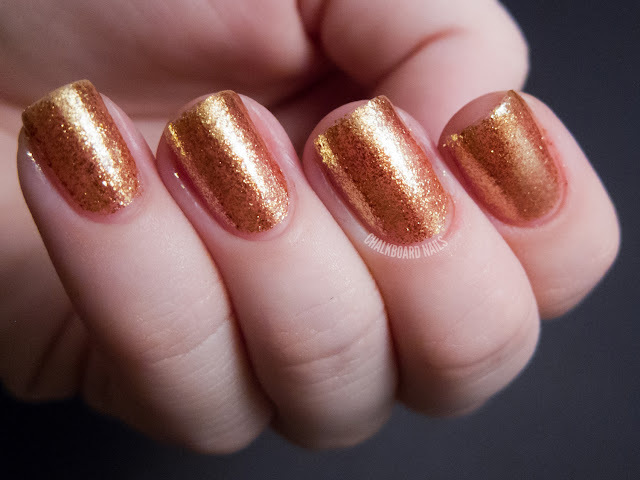 Whoa that jelly sammich makes me want to buy that glitter polish now! Damn it! I LOVE the jelly sandwhich! Oh, & the new blog look is awesome! I had the same jelly sandwich in mind with the glitter ♥. I think i'm in love with all of those polishes! Especially the goldeneye, that one is amazingly beautiful and bright. I love the jelly sandwich! 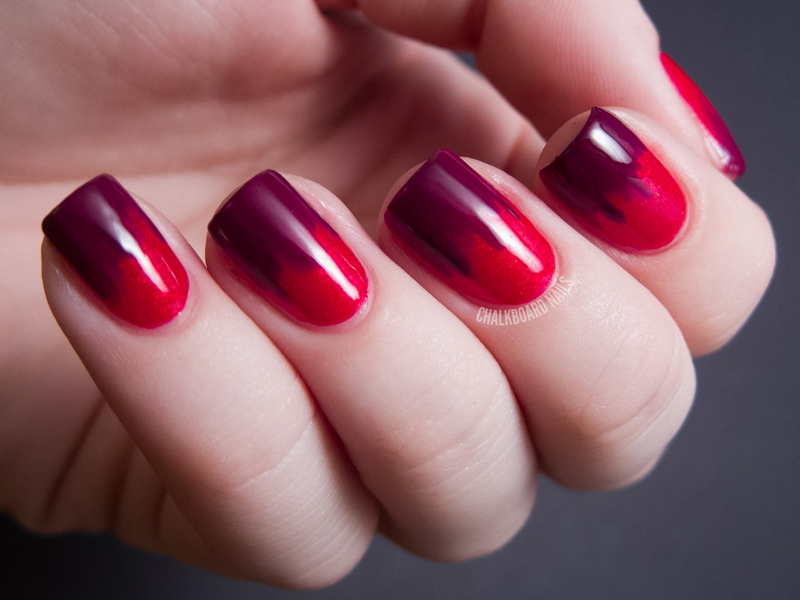 It doesn't even look like a jelly sandwich, it looks like one amazing polish. 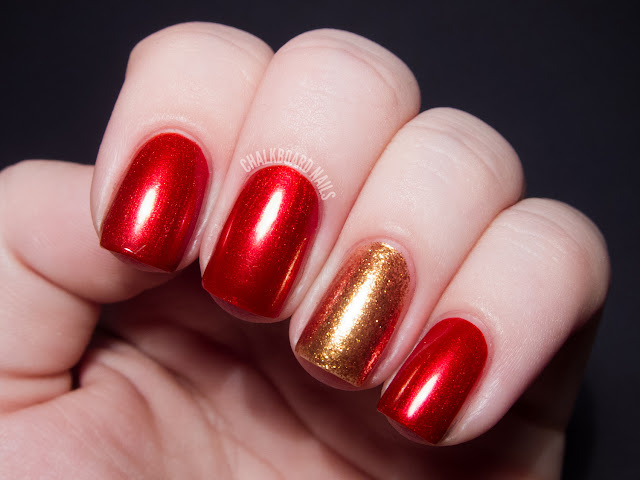 Great polishes, pix and post! PS - the new blog theme works beautifully with the gorgeous images! These are sooo pretty. I can't wait to play with my set. These polishes look great with your skin tone. I LOVE that glitter and will get it if I find it. I love the gelly sandwich, it looks almost like a matte/suede finish! These are so subtle but gorgeous! I love the first manicure soo much!! I love that last manicure! Some of my favorite swatches of these! !